The Lockheed Martin Vector Hawk UAS can reconfigure to match specific missions. Lockheed Martin was awarded a $4.6 million contract from the Combating Terrorism Technical Support Office for the continued development of a maritime canister-launched small Unmanned Aircraft System (sUAS). “We are extending our sUAS capabilities to tactical maritime users with the Vector Hawk’s innovative canister deployment and launch ability,” said Jay McConville, Lockheed Martin director of business development for Unmanned Solutions. Lockheed Martin is currently working on a re-configurable version of the collapsible wing Vector Hawk. 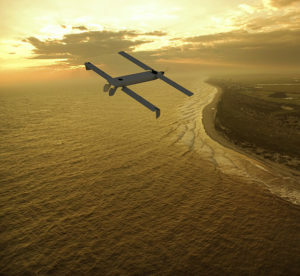 The Vector Hawk design is well suited to support a man packable all in one solution that includes: a fixed-wing aircraft for standard and long endurance missions; a collapsible fixed-wing aircraft that can be launched from a tube from land or water; a vertical takeoff and landing aircraft; and a tilt-rotor enabling VTOL with transition to forward flight. Vector Hawk is capable of autonomous flight and landing, which shifts the operational focus from flying the aircraft to conducting the mission. The system also incorporates fail-safes to ensure it can safely return to the user or auto-land when situations such as loss of communications with the ground control station or low power occur. Vector Hawk is built with an open architecture to enable rapid technology and payload integration. 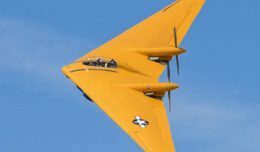 Each week, Bob Alvis interviews local veterans, community volunteers and aerospace related guests on AV Veterans Talk, sponsored by Aerotech News and Review. The podcasts are uploaded to the Aerotech News and Review Facebook page as well as our YouTube channel. Aerotech News and Review, published the first and third Friday of the month, serves the aerospace and defense industry of Southern California, Nevada and Arizona.